With many health experts calling sitting the new smoking, more and more people have been looking to reap the benefits associated with standing while working. But buying a standing desk can be a luxury that not everyone can afford if you’re living in a small space, or have a limited budget. With these constraints in mind, Xdesk recently launched their revolutionary new Flex, a 7-in-1 power-adjustable solution that can act as a coffee table, a regular desk, a standing desk, a dining table, a kitchen countertop, a work surface, and even a bar cart. Check out a video of the Flex in action below. Xdesk Flex™ from Xdesk on Vimeo. Described as the “world’s first power transforming table” by Xdesk, the Flex can virtually replace all of the other tables you would ever need in your living room. Equipped with a microprocessor-controlled lift system, the Flex’s durable bamboo surface can be adjusted to over 200+ positions so that you can go from standing and working on a report to kicking back and watching TV in a matter of seconds. The Flex’s versatility makes it perfect for tiny apartments. The Flex’s wireless rechargeable battery lasts for up to two weeks of use between charging and keeps it mobile in case you need an extra cooking surface in the kitchen or a computer desk in your bedroom. The Flex is available in three bamboo finishes: light, medium or dark. With a price tag starting at $599, it’s definitely not cheap but is a pretty good value if you consider all of the other surfaces it can replace. With many health experts calling sitting the new smoking, more and more people have been looking to reap the benefits associated with standing while working. But buying a standing desk can be a luxury that not everyone can afford if you're living in a small space, or have a limited budget. With these constraints in mind, Xdesk recently launched their revolutionary new Flex, a 7-in-1 power-adjustable solution that can act as a coffee table, a regular desk, a standing desk, a dining table, a kitchen countertop, a work surface, and even a bar cart. Check out a video of the Flex in action below. 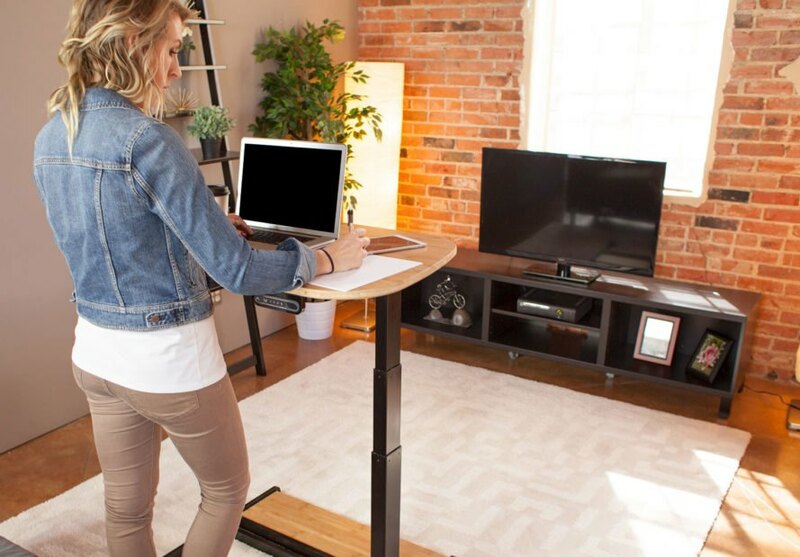 Described as the "world's first power transforming table" by NextDesk, the Flex can virtually replace all of the other tables you would ever need in your living room. The Flex's versatility makes it perfect for tiny apartments. The Flex's wireless rechargeable battery lasts for up to two weeks of use between charging, and keeps it mobile in case you need an extra cooking surface in the kitchen or a computer desk in your bedroom. Equipped with a microprocessor-controlled lift system, the Flex's durable bamboo surface can be adjusted to over 200+ positions so that you can go from standing and working on a report to kicking back and watching TV in a matter of seconds. The Flex is available in three bamboo finishes: light, medium or dark. With a pricetag starting at $599, it's definitely not cheap, but is a pretty good value if you consider all of the other surfaces it can replace.